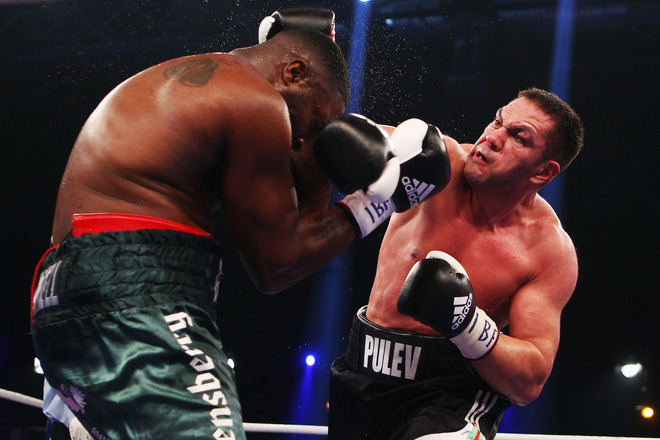 British heavyweight Michael Sprott was forced to retire on his stool at the end of the ninth round of his fight against unbeaten Kubrat Pulev in Offenburg, Germany. The 30-year-old Bulgarian (15-0, 7 KOs) dominated the bout from early on and was coasting towards a points win before his veteran opponent eventually threw in the towel. Sprott (36-18, 17 KOs), who was returning to the ring for the first time since an unsuccessful bid for the European heavyweight title back in September, has now lost his last three fights and offered little to trouble Pulev on this occasion. On the same card, Arthur Abraham won the vacant WBO European super middleweight title with a fifth-round stoppage of Pablo Farias. The German (33-3, 27KOs) knocked his Argentine opponent (19-2, 11KOs) down three times in the fifth round before the referee intervened. Meanwhile Robert Stieglitz claimed a unanimous decision over Henry Weber to retain his WBO super middleweight title.